Special Collections has particularly strong holdings in the field of mycology thanks to the 1969 acquisition of the Clarence J. Humphrey mycology collection. Dr. Clarence John Humphrey (1882-1970) was a scientist and mycologist specializing in wood-destroying fungi. In 1969 the University Library acquired his book collection of over 300 titles, including a number of rare 18th and 19th century imprints in Latin, French and German focused on the subjects of botany and fungi. Dr. Humphrey was one of the first mycologists to work internationally. After joining the U.S. Forest Service and earning a PhD in Botany (University of Wisconsin, 1922), he traveled to the Manila Bureau of Science where from 1926-1934 he was in charge of the mycological and plant pathological work for the Philippines. In 1932 he spent eight months traveling and studying in the famous herbariums of Great Britain, France, Norway, Holland, Germany, and the United States. Later he returned to the United States and became Regional Pathologist with the Soil Conservation Service at Safford, Arizona. He moved to Los Angeles in 1938 and worked in the pest control business until his retirement in 1954 at the age of 72. Kawamura, Seiichi. 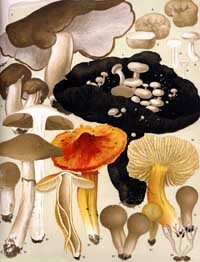 Illustrations of Japanese Fungi. 1911. This work is one of the earliest quality accounts of fungi in Japan and served both scientific and popular interests. Its many colored plates are strikingly beautiful. Today, Japanese scientists are among the leaders in advancing mycological research. In Japanese and English. Mycology is the branch of botany dealing with fungi. Originally the word referred to the study of mushrooms, which are among the largest and most dramatic looking fungi. Mushrooms have played a role in the religion and beliefs of certain Indian tribes. Although the systematic study of fungi has only been conducted over the last couple of centuries, ancient peoples were well aware of fungi as food, medicine, and poison and they were familiar with the process of biological fermentation such as that occurring in wine production and the baking of leavened bread. Fungi are both destructive and beneficial, causing disintegration of organic matter and diseases in plants, animals and humans, yet aiding in the making of bread, wines, beers, certain cheeses, and a number of antibiotics. Fungi have important economic significance as they impact building construction and food production. The great potato famine in Europe during the 1840’s was caused by a fungal disease. It proved to be a turning point for the study of mycology and prompted an explosion of research on fungi by the western scientific community. Many of the books in the Humphrey Mycology Collection are early examples of the results of this pioneering research.